rif tends to suggest Italiannies when we run out of ideas on what to eat in shopping malls. Since I didn’t have a better suggestion that particular weekend, Italiannies it was. I like the fuss-free decor and comfy atmosphere of Italiannies at The Gardens. As for the food, I’ve always found it average and slightly on the pricey side. 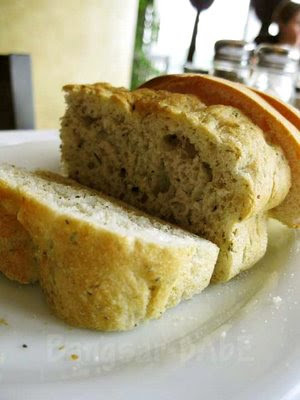 While waiting for our mains, I helped myself to two servings of freshly baked bread dipped in olive oil and balsamic vinegar (I was really, really hungry). rif always orders the fettuccine in creamy carbonara (RM29.90), as he knows I love my pastas creamy. Italiannies version is decent, but it is sometimes inconsistent. 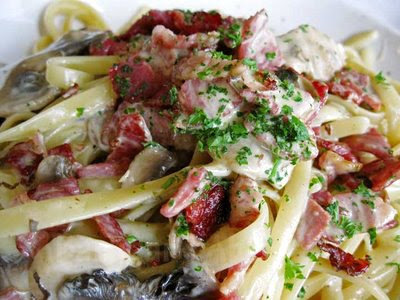 The fettuccine came tossed in cream sauce and topped with smoked beef bacon, turkey ham and fresh mushrooms. I found some parts underdone, but rif thought it was fine. 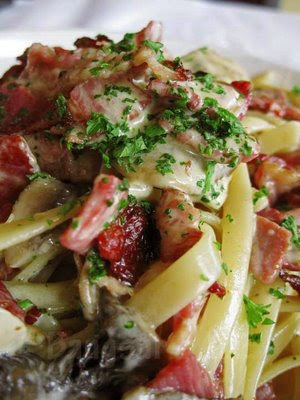 They were pretty generous with the beef bacon, and we were lucky our pasta turned out nice and creamy. The table next to us ordered the same thing, and it looked terribly dry! 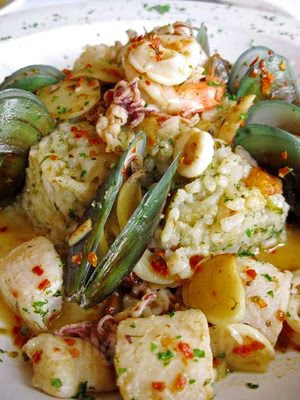 Since I didn’t get to eat seafood rice the night before, I ordered the seafood risotto (RM30.90) to make up for it. 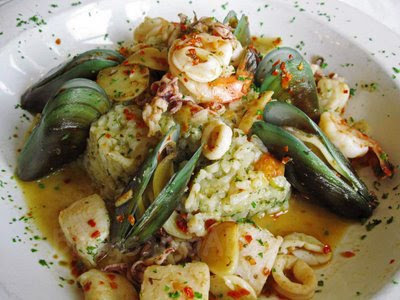 Risotto is an Italian rice dish that has a smooth texture and is often flavoured with mushrooms, asparagus or seafood. The risotto was creamy, al dente and well separated. It tasted slightly spicy with an earthy undertone. 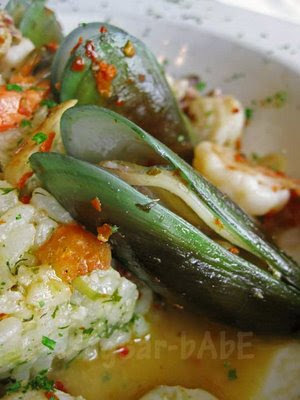 While the squid, scallops and prawns were fresh, I was disappointed to find that the mussels were not. Mussels aside, it was palatable. I found the risotto better than William’s version. It was not a full house that day but the waiters were far from attentive. I had to wave many times just to get the bill and another glass of water. 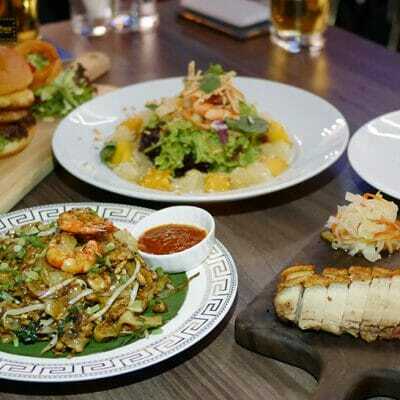 Lunch cost RM70 for the above inclusive of tax and service charge. Not cheap, but the ambiance was ideal for rif and I to catch up on each other’s week. Verdict: Average Americanized Italian food with mid-range prices. not really a fan of Italiannie's risotto. the last time i tried, they were too soggy and wet, every mouthful was a disaster. hie Sue, my boyfie used to be the GM for this outlet 🙂 nevertheless, food was always good even though i disguised myself to try out how good it was sans my boyfie's "help". haha :)a little note though, i find the complimentary focaccia tough, tasted like day old bread being toasted. but there is one dessert worth trying; tiramisu. made from italian sponge fingers, mascaporne cheese and Tia Maria. better than Bakerzin's! a bit too pricy, and the food is so so. i would go dwn 1 floor and eat alexis..they definitely have better desserts haha..
Italiannies.. been there twice, first time wasn't impressed by their bland seafood pizza. The second time I thought that their clams were OK though… but the pasta still didn't meet my expectation. 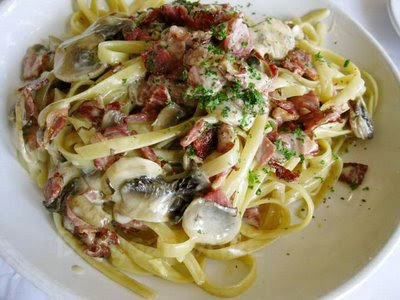 leo – So far, only the carbonara was decent; I don't like their meatball spaghetti. I only eat their smoked salmon pizza, but to me is not as good as Souled Out's version. jim – Agree…but I guess that's the price you have to pay for better ambiance. I like the breads there, too! Their pizzas are not too bad either. the Tuscan bread is nice 🙂 but i find the pizza crust a bit too thick and chewy, it's as though biting into a very thick bagel. sibu food diva – Like you, I find their pizza crusts a tad too thick!